I’ve been married for almost 19 years to my husband Ramjan, and we have four beautiful children. Between us we lead very busy lifestyles and so very rarely do we get the chance to go out for dinner… without kids! To my delight, Janine, the editor of Viewpoint, asked if I would like to review Amarone Italian Restaurant in Ringwood for the upcoming publication, which made me feel very excited. 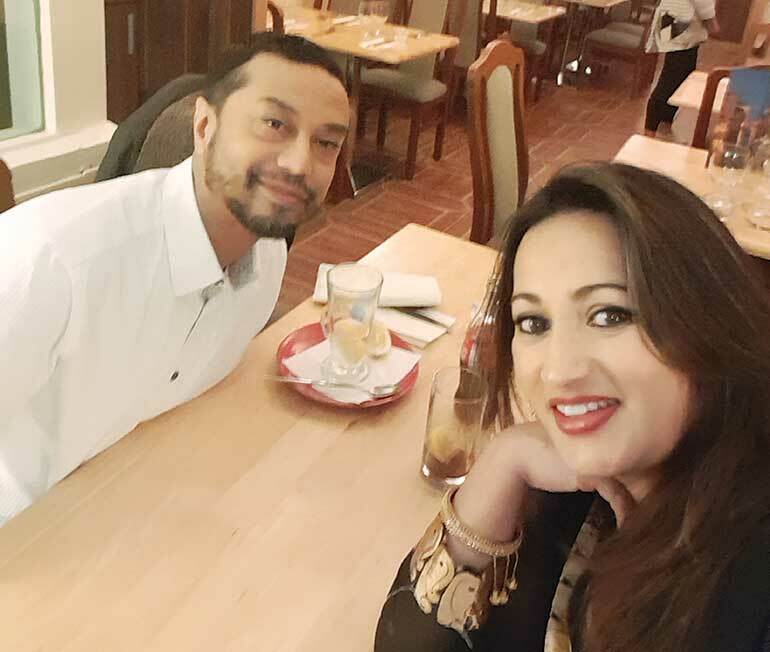 So, on the night of the super blood wolf moon, Ramjan and I got ready to have an evening out. The journey took less than 15 minutes from our home and we arrived early. The restaurant, which is named after an Italian wine, was tucked away on Christchurch Road, but nicely lit up. Upon entering we were greeted by a true Italian waiter who looked stylish and suave. It was an unusually cold evening, so I was pleased the interior was warm. We were shown to our table next to the window and I was rather impressed by the comfortably warm radiator. Andrea Bocelli’s romantic opera voice filled the restaurant with true Italian grace, which set the standard for a wonderful evening ahead, adding even more character to the 44-seater restaurant. Traditional paintings of Italy line the walls while the Italian flag on the ceiling with bottles of wine strategically placed around it, give the restaurant a cosy and charming feel. Ramjan felt as though he’d been transported to a small Italian village. There was a small bistro table outside the front of the restaurant with two seats and some planters, giving customers a nice welcome. Amarone is clearly well-known locally, as most of the couples who entered after we did, appeared to be regular diners who were greeted with warmth and kisses on both cheeks. After selecting our starters and mains from the menu, we were served nibbles of olives and warm, home-made toasted bread with olives which had been prepared with onions and garlic, balsamic vinegar and olive oil to dip the bread in to while we were waiting for the starters to arrive. It was nice to be informed by our waiter that the dishes are cooked to order so, if you don’t want a particular ingredient, the chef can remove it, to make it perfect for your taste. I ordered the calamari with garlic bread as a starter. The calamari was dusted with flour and deep-fried so it was crispy and that’s exactly how I like my calamari. It was served with a side-salad and a delicious fresh lime dill dip. Ramjan had the Gamberi all’Aglio which is pan fried black tiger prawns in white wine with a fresh garlic and chilli sauce, served with home-made bread lightly brushed with garlic. I couldn’t resist trying some. This dish must’ve been cooked with the finest tomatoes. It was perfectly balanced with the added herbs. Garlic bread, slightly overcooked on the underside, suited Ramjan, but I prefer mine to be light and fluffy rather than crispy. It took around 20 minutes, after we finished our starters, for the mains to arrive. 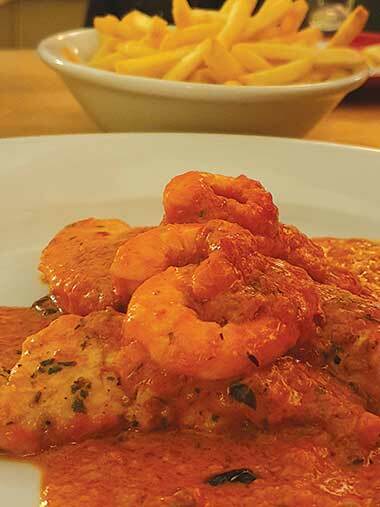 There was no way I wanted to be eating pizza on our date night, so I chose the Pollo Gamberetti, which was pan fried chicken breast with king prawns, onion, garlic and chilli with a dash of white wine and a hint of cream and tomato sauce. My main was very rich, full-flavoured and moreish. The prawns were plump and juicy while the chicken was moist and succulent. The fries went well with it, but if you prefer, you could choose to have it with vegetables, rice or salad instead. 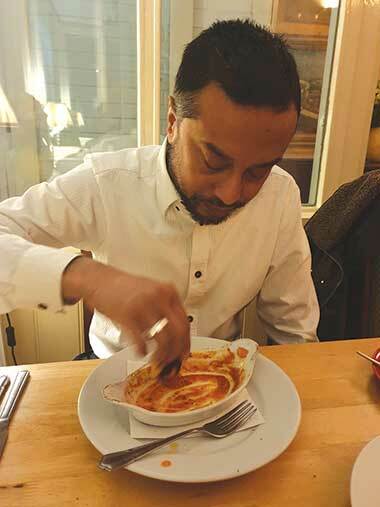 Ramjan’s spaghetti was not as rich and full-flavoured, and when he looked longingly at my dish, I let him have a taste – after all, it was date night. The meals were filling, so for dessert we chose to share a chocolate fudge cake. It came out very quickly, but clearly was not made in house which is a shame as everything else they made was on point. When people go the extra mile with the small things, it makes a huge difference and we felt it was a truly perfect ‘Date Night’ for us both. The staff at Amarone were hospitable, the food was delicious and the ambience was perfect. We will definitely be going back again soon.